You analyze price bar trends by defining when a downtrend is relatively harmless and when an uptrend is relatively significant. The textbook uptrend is a series of up-day price bars (close higher than yesterday) that have higher highs and higher lows in a preponderance of the bars. A downtrend is a series of down-day bars characterized by lower lows and lower highs in most of the bars. Judge significance by eyeing the chart. 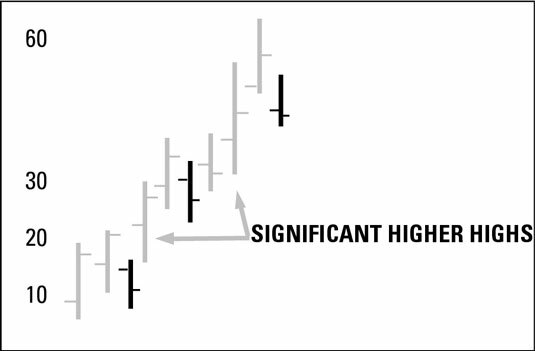 In the preceding figure, two significant higher highs stand out. They each represent a 50 percent gain from the previous up day high. Also, every high is higher than the day before, but every significant high is higher than the highs that came before. For example, a preponderance of higher highs may mean a simple majority, say six of ten bars, accompanied by six of ten higher lows. However, determining a preponderance is your call. Maybe you like seven out of ten. You can eyeball it or use software to develop a precise definition and backtest it on historical data.